Forget about the accumulated waste in your home, office, shop or garden with our 24/7 rubbish collection services in London. Are there any big boxes around your office you need help disposing of? Have you had the house refurbished and want the old furniture thrown away? Give us a call and we’ll make sure your domestic or commercial property is left with no signs of rubbish at all. The waste removal London teams of trained and experienced professionals have the skills and knowledge to design a rubbish collection service according to your needs. And all this at a price that is hard to beat. So, dial 020 3404 4868 now and let the experts of 24/7 Waste Removal save you time and money! Delivering five star waste collection is what we do, and have been doing at 24/7 Waste Removal for over 10 years – ever since our company was established. The high quality of our waste removal London services is just one of the reasons why clients choose us. Learn more below! Local teams – we have teams located all around London ready to come and take your rubbish away on the very same day of your call. There are no hidden charges with us, you only pay for the amount of waste we collect and dispose. Our waste clearance services come with a guarantee and regular quality control. We work 7 days a week, and even offer same day services, when you are in need of one. We are a company that takes care for the environment, and make sure all recyclable waste is recycled. Why Trust the London Rubbish Removal Team? Despite the large number of rubbish removal companies in M25, finding a reliable one often proves to be a challenge. When you decide to trust 24/7 Waste Removal, you are in for a treat. 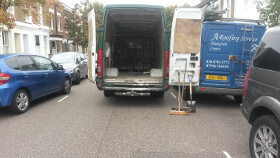 The team includes some of the best and most qualified London waste removal experts in the business. Hiring us brings along many great benefits. You will receive a visit by trained in safely handling rubbish, and experienced team members. Every junk removal technician we employ is fully background checked and insured. You can easily recognise us - we arrive in branded vehicles, wear branded uniforms and name tags. Our experts are English-speaking, friendly and always smiling. We will be with you on time, saving you waiting around for hours. "The price was excellent and so their team. The boys worked really hard to get me rid of my waste as quick as possible. They are friendly and easy to get along with. I will definitely use you again!" The best waste collection service I have ever had, mates! Your operators and workers were so nice and really efficient. I have recommended you to my girlfriend as she has some furniture to be thrown out. I think you do a great job. Thanks a lot! Call 020 3404 4868 now for quick bookings on professional waste collection in London! Our customer care representatives are awaiting your call ready to help you out. You can call us to get an instant quote. Once on site, the team will provide you with an exact price quote based on the amount of rubbish you want to dispose of. Only after you agree with the price, we will go ahead with the actual picking up and loading. Make sure to check we have taken everything you wanted us to. Only after we are done, we’ll arrange the payment and the team will be gone, along with your unneeded items. In case you prefer to arrange the disposal of your domestic or commercial waste online, fill in our contact form. One of our advisers will call you shortly to guide you through the process of arranging a waste collection, and will help you book it for a day and time that suits you best. Call us on 020 3404 4868. We give you a quote and arrange a time slot for you. When we arrive we confirm the quote. If you’re happy with the price, we get your junk and leave.